Back From Bonneville Sorry I've been very slow putting out the newsletters, starting a new job and taking the time out to got the Bonneville Speedweek has jumbled things around. James & I went to Speedweek where we do the official timing for the BNI (Bonneville Nationals Inc.) This is where we earn the money to feed our filthy racing habit. We have to be on the salt at 5:30 AM and have the system up and running by 6:00 then we sit around until about 7:00 PM and shut it all down. One of the perks is getting to watch some FAST cars. NHRA and NASCAR, eat your heart out! There are also a few fast trucks, Phoenix does over 260 Mph in the flying mile. 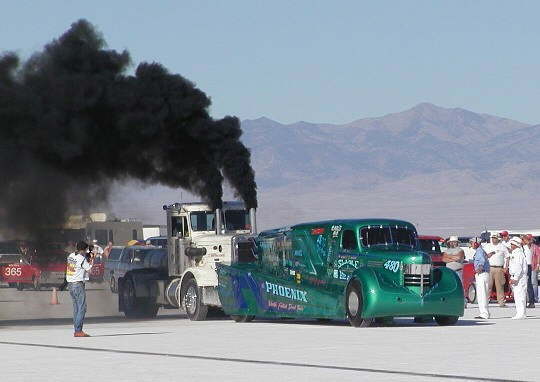 This "pusher" truck takes the phoenix up to about 120 Mph. This combo couldn't pass a smog test in Mexico City! As it leaves the line this set has 24 Cylinders, 6 Turbos and 3 Superchargers! It only burns 10 gallons of diesel fuel during a 5 mile run but the intercoolers eat up 25 $2.00 bags of ice. What a hobby. A streamliner running a Hayabusa motor (Much more "built" than ours) did a 290 mph pass, a lakester in our class (also Hayabusa powered) did 220 Mph. We have some work in front of us. Were planning to bring the car to the BNI World Finals in October, so were looking for a motor head that wants to crew. In late July, We pulled the Hayabusa motor out of the car so we could rebuild the top end: New cams, more displacement, Higher compression... We were hoping that while the local races were shut down during August the work could be completed. 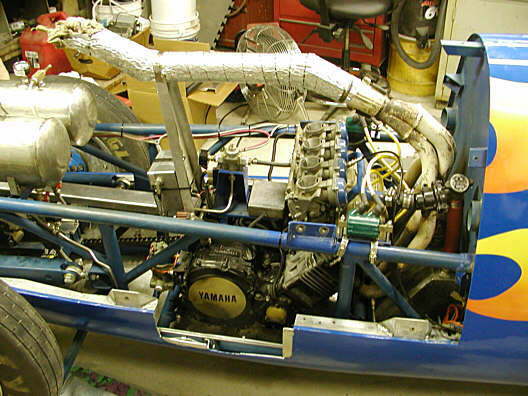 Unfortunately it's taking a little longer so with little choice we reinstalled the little Yamaha 750cc motor. Our old car took several weekends to change out a motor, but we designed this one to be much faster. It only took 15 minutes to bolt in the small motor and another hour or so to hook up the water, fuel, chain and electronics. Next time I'll let you all in on the detales of the rebuilt motor. Were trying to get these newsletters posted on our web site but we some times fall a little behind.